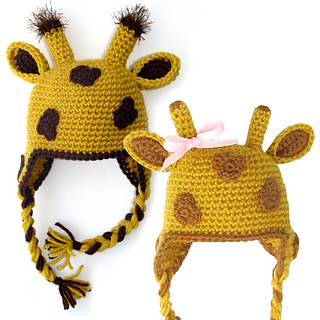 This giraffe hat pattern will help you make the perfect photo prop or adorable winter hat for the little giraffe lovers in your life! It is a very simple, yet detailed pattern so even those with little crochet experience can find success! -Skills: Single crochet, double crochet, half double crochet, slip stitch, working in rounds, increasing, decreasing & basic sewing. -Hooks: You will need a 3.75 mm (F), 4 mm (G), 5 mm (H) & 5.5 mm (I) hook IF YOUR GAUGE MATCHES MINE! You may not need to use every hook size listed. Hook sizes depend on what size hat you make, but all sizes require an I hook for the hat base. I used Vanna’s Choice Yarn. One ball of main color is needed for baby & child sizes while 2 balls are needed for adult sizes. I also used just a bit of furry yarn, which is optional. Vanna’s Choice Yarn- Less than one ball is needed for accent color.